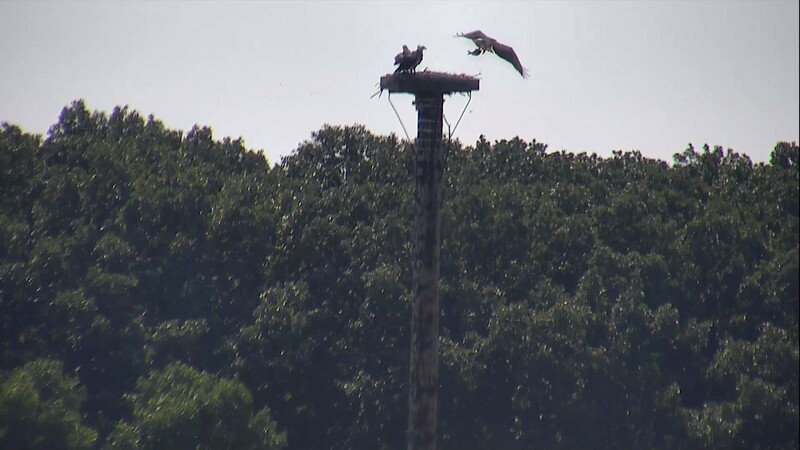 The Okoboji osprey pair and their three grown chicks are gone for the season, last spotted about the second week of September before heading south. But where exactly are they going? And why do they leave? We’re not exactly sure. 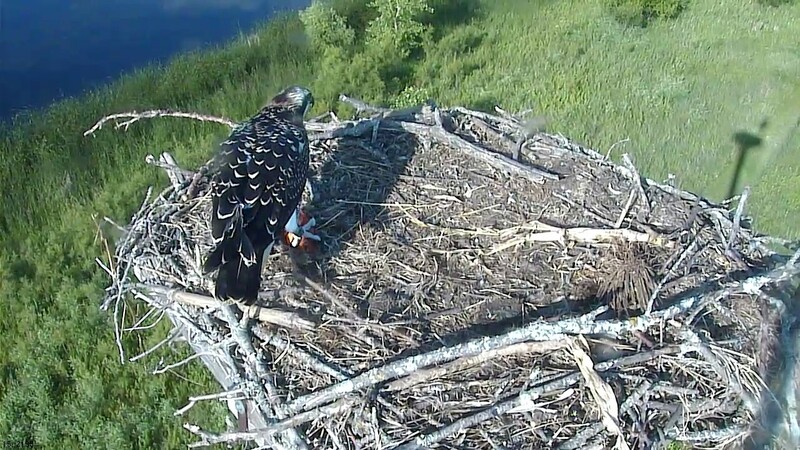 Although the osprey male that has habited the Dickinson County Nature Center nest the past seven years is banded, he does not have a tracking device on him. Studies have found, though, that osprey that breed in the Midwest typically overwinter in Mexico, south all the way to South America, with a small number in the Caribbean. 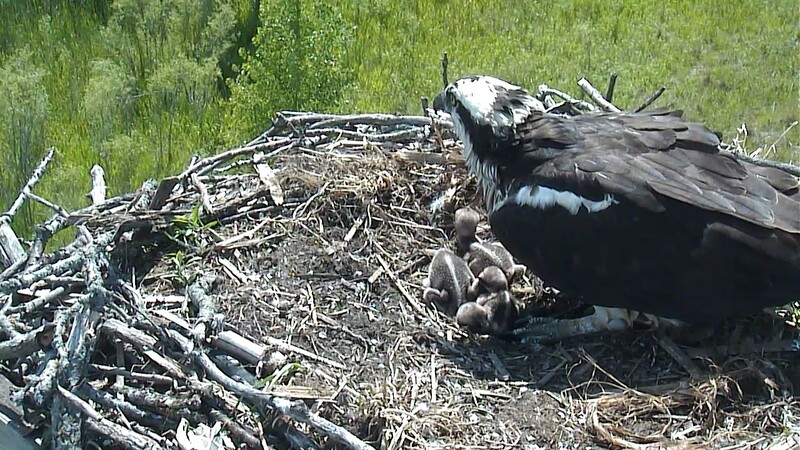 The short answer is, then, that we’re not sure exactly where our Okoboji osprey end up. And they don’t all end up in the same place. Osprey do leave to head south as individuals, not as families. The typical departure schedule is the female adult leaves, then the male, followed by the full-grown chicks. Each one decides where it will overwinter. It could be one ends up in Colombia, one in Venezuela, one chick in Mexico and two in the Caribbean. There’s no real way to tell exactly where an osprey winters except for satellite tracking devices, although studies have put together regional pattern for the raptors that live on six of the seven continents. The osprey that nest in the western United States overwinter from southern Texas through Mexico and into southern Central America, however, rarely in South America. Osprey from eastern U.S. breeding sites overwinter in small numbers in the Caribbean and mostly in South America. An osprey takse 15-50 days to complete its migration, and it may log more than 160,000 migration miles in its 15- to 20-year lifetime, which could boil down to 8,000 miles per year or 4,000 miles for a one-way trip. 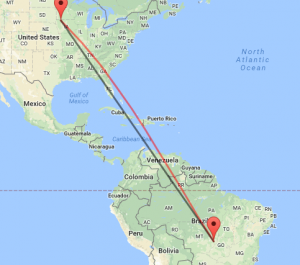 A straight line from Okoboji to central Brazil is approximately 4,800 miles, so most likely our osprey are somewhere in the northern half of South America. Some osprey, however, don’t migrate at all. Why do osprey leave their breeding site? Osprey that live in mild climates such as Florida, the coasts of Mexico and the Caribbean typically stay year-round. They have plenty of warmth and plenty of food. Osprey that nest in places such as Iowa would not only have to deal with cold temperatures, which they most likely could survive, but frozen lakes and wetlands where they would normally fish. Even if the waterways are open, colder temperatures drive fish deeper, and osprey need fish about three feet or less below the surface in order for them to dive safely. The chicks will stay in their overwintering site for a summer season and will return the following year, about a year and a half after they left their fledging site. 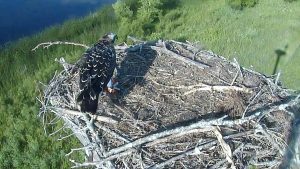 They will return to within an approximately 50-mile radius of their fledging site. It is important to note, though, that only about half of juvenile osprey will live long enough to nest because of the perils found during migration. The osprey adult pair will spend winter alone and then fly back to the nesting grounds separately, meeting in Iowa about the first or second week of April. They come north to migrate usually because of spatial reasons. The United States and Canada offer breeding grounds with more room, food and nesting habitat than the places that osprey overwinter. How do osprey get to their overwintering site? Much like how monarch butterflies navigate, osprey also migrate based on many different factors. It is thought that osprey begin migration when instinct to move is triggered by daylight dwindling, however, Caribbean birds that migrate don’t have such a change in daylight and still know when to go. One article said that osprey have a genetic compound that tells them when to leave and what direction to travel. After they leave, they will follow the same path for fall migration as they used for spring migration, and researchers think that adult osprey use landmarks to help them find their way. Juvenile osprey would not have traveled south before and therefore wouldn’t be able to use landmarks, so it is thought they use celestial clues — the sun, moon and stars — as well as sensations from the Earth’s geomagnetic force to find their way. Luckily for osprey, their flying strength allows them to take direct routes to their overwintering spots. Unlike other soaring raptors that rely on landforms to create thermals and updrafts, osprey can fly with or without light air. This means they can cross large bodies of water and deserts on the way south, even so large of bodies of water as the Gulf of Mexico or the Caribbean Sea. Plus, these bodies of water offer osprey great food sources. Osprey will stop to eat along their migration route, and they can even carry a fish in their talons to eat along the way. 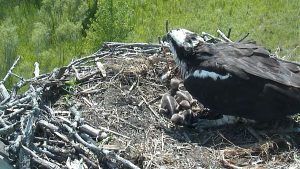 We keep our fingers crossed that migration goes well and the Okoboji osprey will be back in April when we’ll once again have a live web camera to watch their nesting season, from eggs being layed to chicks hatching and growing. For the winter, the web camera is focused on the two rehabilitated trumpeter swans on the Kenue Park wetland. Posted in Blog, mobile and tagged bird migration, do osprey fly south?, do osprey migrate?, iowa osprey, migration, okoboji osprey, osprey, osprey migration, raptor migration, south, when will osprey come back? Way cool! And I used to think I knew something about Ospreys! Interesting! Thank you for the information.